Being considered the world leading authority on something is probably more of a curse than a blessing. All of a sudden you have a reputation to defend and everyone will be annoyed with you when you do not agree with their interpretation about what is happening. To top it off there will be a not so small amount of professional envy directed at you. I am the first to admit that accurately predicting the 2014 eruption at Holuhráun was a lot of fun. I will let the other parts leave be, but I will here address a certain problem that has been around for the last year or so. 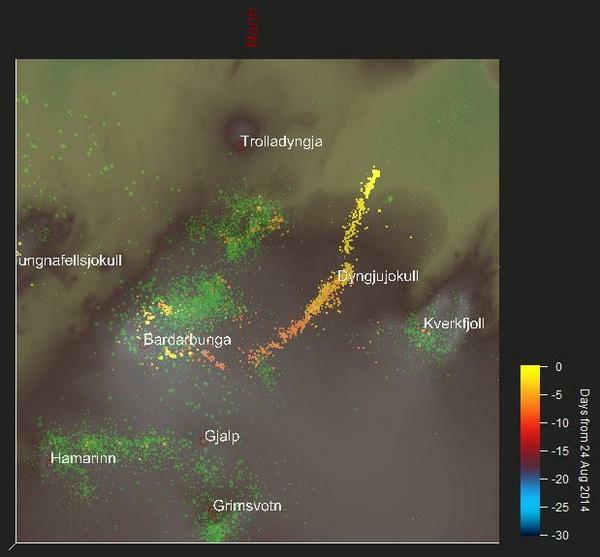 Volcanic map of Vatnajökull updated to include fissure swarms and a few other features. Image by Beardy Gaz and Carl Rehnberg. During the last year I have been stating that the volcano was not ready to erupt and that it was still recuperating after the large eruption. I know this has annoyed quite a few of my readers, and it has also annoyed certain volcanologists since I have pointed out that there were no signs at all of what they were claiming to be happening in the volcano. I have tried to explain why I held that firm opinion, but to put it in a short format. There has up until recently not been a single detectable signal indicating an increased risk for an eruption at the Bárðarbunga Volcanic System, instead all signs pointed towards a recuperation occurring after the eruption. In the end science is reading the scientific evidence that is at hand, misconstruing evidence or stating what is not is not science, that is wishful thinking. Now that I got this off my chest we can get to the fun parts. Vonarskard Volcano moving NW due to the plate it is situated on is moving away from Bárdarbunga causing a lot of tectonic strain under Bárdarbunga. Notice how it inflated during may to november due to Deep root inflation of Bárdarbunga. Image from Icelandic Met Office. To understand what is happening now we must go back in time to a year before the start of the large Holuhráun eruption. First we have to remember that for reasons not entirely understood Bárðarbunga is the world’s noisiest volcano, even at the best of times it was repeatedly suffering from massive earthquakes and earthquake swarms. So, just because this volcano is causing a lot of seismic noise it is not a sign in and of itself that is close to an eruption. The trick is to understand that not all earthquakes are equal. Most earthquakes at Bárðarbunga are tectonic in nature and most often are not indicative of volcanic activity. To understand what is happening you need to understand the importance of location, earthquake type differences, earthquake progression and so on and so forth. Otherwise you will inevitably over-interpret things at an alarming rate. The last large eruption prior to 2014 was in 1910 and as far as we know there was no eruption between that one and a 30-minute-long intra-caldera eruption that happened in 1996. This eruption was probably caused by the same M5.2 non-double-couple non-volumetric-change earthquake that caused the Gjálp eruption at Grimsvötn. In retrospect we can state that 1996 is the year when Bárdarbunga was fully charged and primed to set off in an eruption. Most likely this eruption was delayed by distal stress release from the 1.5 cubic kilometer eruption at Gjálp. Be that as it may, for some unknown reason the fuse was not lit on Bárðarbunga until 2014. It is well known that the mantleplume under Iceland is cyclic in nature with a periodicity of 100 to 150 years between cycle peaks. There is as of now no explanation behind this cycle in magma production from the mantleplume. The effect of this cyclicity is that we get far more eruptions during the peak and that those eruptions are larger than those during the waning part of the cycle. We knew already that we had entered a peak of that cycle, both from the time that had gone since the last peak and from the increased activity of Grimsvötn that first suffered the massive Gjálp eruption in 1996 and two medium-sized eruptions in 1998 and 2004. 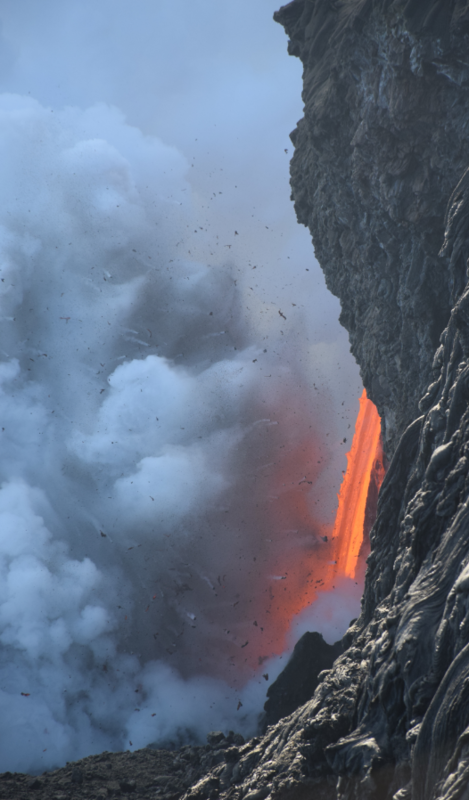 And as the massive 2011 eruption happened we saw that the magma composition had changed in such a manner that we knew that fresh magma had entered the system indicating the effects of a mantleplume activity peak. 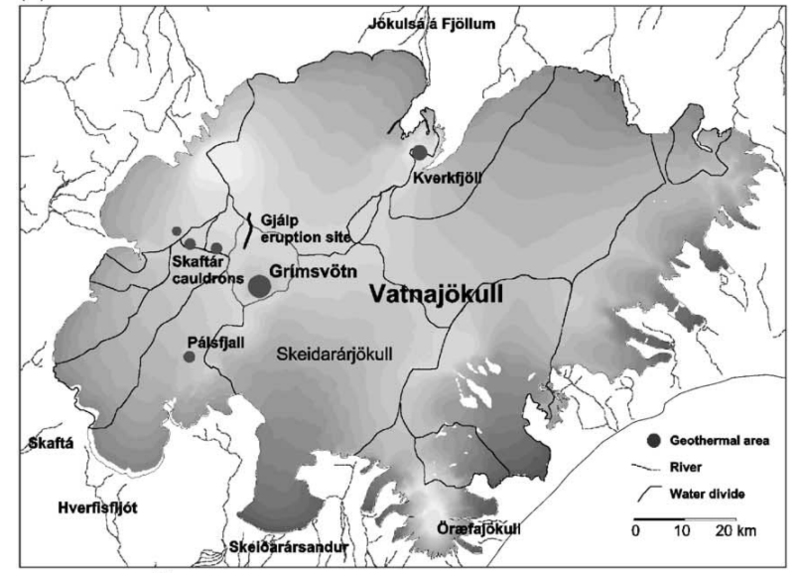 The difference between Grimsvötn and all other volcanoes in Iceland is that Grimsvötns high rate of eruptions has kept all conduits open, this means that there will be little or no seismic evidence of magma rising. We therefore had no clear image of what the start of the peak of mantleplume magma production would look like on the Icelandic seismometers. In 2012 I hypothesized that the effect would be like a pillow hitting a madras from below and that we would see a marked increase in deep earthquakes of low magnitude at depths larger than 20 kilometres and that they would be dispersed over many places directly affected by the head of the mantleplume. In 2013 we started to see exactly that happening at Askja, Bárðarbunga, Kistufell, Urðarhals, Vónarskárð and at a spot that is most likely an unnamed volcanic field situated very close to where the dyke turned northwards toward Holuhráun. One of the least affected areas was Bárðarbunga, but there was a few 25km deep earthquakes 8km West-Northwest of the caldera towards Vónarskárð. Image from the Icelandic Met Office. At that point my theory was that all we had to do was to sit back and wait for the fireworks to begin and that we in a while would see seismic activity pick up at one or more of those spots and that the pertinent place would be where we got a clear upwards moving stack of earthquakes indicating the formation of a magma conduit. In early 2014 we started to see that there was increased seismic activity at (in order of amount of unrest, least to most) Kistufell, Bárðarbunga, The unnamed volcanic field and Urðarhals. At Bárðarbunga we saw earthquakes all over the place between 7 and 15 km depth around the magma reservoir indicating an increase in pressure. At the Unknown volcano a conduit formed from depth up to around 12km depth. Urðarhals never really got going beyond dispersed earthquakes. Instead it was Kistufell that turned really rambunctious. Kistufell had at the time suffered no postglacial eruption so it was with fascination I followed how a conduit formed from depth and with even more fascination I saw how the rising magma ended up in a living breathing magma reservoir at about 8 km depth. There the magma stalled for a while. At the same time tectonic earthquake activity picked up at Bárðarbunga. Both Kistufell and Bárðarbunga are on the same fissure swarm with several fissures running between the volcanoes, and in the end this turned out to be too much and the magma reservoir under Kistufell breached towards Bárðarbunga and a dyke formed from Kistufell into the magma reservoir of Bárðarbunga. Open access low resolution drumplot of the event. It shows that there are differences to these earthquakes compared to the previous events. Image from Icelandic Met Office. As Bárðarbunga was force fed magma it in turn breached towards the East and in the end 2.5 cubic kilometers of magma left the magma chamber out of which 1.5 cubic kilometers erupted through the vents at Holuhráun. After the eruption none of these signs have been evident due to the widespread systematic pressure loss caused by the large eruption. Instead we saw a high level of seismic unrest with signatures indicative of settlement inside the caldera and deep refilling of the lower magma reservoir under Bárðarbunga. Due to the very large amount of magma that left the magmatic system of Bárðarbunga I stated that it would take a minimum of two years until Bárðarbunga would be able to erupt again. Even at such a productive place as this it takes time to produce a pressure equivalent of 2.5 cubic kilometers of magma in the magma chamber. Do note that pressure equivalent is not the same as the actual volume, it will take between 10 and 100 years to produce that volume of magma. During the following two years we saw brittle tectonic earthquakes with slip direction indicating a massively dropping caldera plug and we also saw that there was a general deep inflation on the GPS stations. Or in other words, common recuperation after a large eruption in an active system on top of a large mantleplume. So, for two years I played the part of being a spoilsport once every single week explaining that the M3+ earthquakes was boring and not a sign of impending ultra-doom. Low frequency plot of the same event as above. Image from the Icelandic Met Office. A couple of months ago, an uptick in those deep unassuming earthquakes at 25km depth started again. First at the unnamed volcanic field NNE of Grimsvötn that the Holuhráun dyke bounced against as it turned north, then at a spot south of Grimsvötn at a volcano named Hábunga, then at Askja and right before Christmas at a spot 8 kilometers WNW of Bárðarbunga. If we now utilize what we learned during the runup to Holuhráun we can surmise that the next eruption will occur at one of these places. Since Grimsvötn is an open-ended system we should probably include that volcano since it will not suffer from deep pressure earthquakes since the magma would go straight up without causing noise. From GPS-data we know that Hábunga has inflated a lot since May so that is a good spot to suspect an eruption, but since that volcano has not erupted for a long time and there has been a lack of seismic unrest there I think we must wait for anything to happen there, if anything at all happens. So far we have not seen activity indicating rising magma at the unnamed volcanic field meaning that we are no nearer to an eruption than before. Askja could have been a good bet, but nothing seems to be out of the ordinary there as of now. This leaves us with Bárðarbunga itself. And finally the friends of Bárðarbunga has some good news. Earlier today there was a very short lived earthquake swarm. If you just look at the location and type, there is not much that looks different compared to previous brief outbursts. Today’s event is one of the more short-lived, it was formed by rather few earthquakes and the size is to be honest not much to write home about. So, why now should we be interested? Well, the answer is that the signatures of the earthquakes are different. Previously the signals have had a sharp clean initial break indicating tectonic type earthquakes. This time around the M3.5 earthquake started with an indistinct “muffled” part prior to a large tectonic-looking part. It is then followed by an indistinct smaller earthquake with a prolonged tremor-coda and several even more indistinct earthquakes. This points towards magma moving causing increased pressure that in turn caused a tectonic earthquake with magma rushing in filling the fractured rock with repeated smaller volcano-tectonic type earthquakes. If magma is involved we should be seeing a low-frequency component to the earthquake and lo and behold, we did. During the Holuhráun eruption there were episodes of unrest running from Bárðarbunga towards Vónarskárð, it was at the time interpreted as a secondary dyke running towards the WNW, but there is an equal chance that this is a part of the magma reservoir of Bárðarbunga that is situated outside of the caldera, or that this is a permanent feature that is where the magma leaves Bárðarbunga when an eruption occurs at Veiðivötn. What happened today is not the runup of an eruption, but it marks the turning point for Bárðarbunga when it could erupt. It is though good to cast one’s memory backwards and remember the incredible hubbub that preceded the 2014 eruption. But, if you see an earthquake swarm start that runs for hours with several large earthquakes then it is time to let your imagination run free. And yes, you all have my blessing to go Bárðarbonkers. Because soon the Bárðarbung will leave the Bárðarbunghole and we will have a bit of firework again. It is though still too early to say when, where and exactly how yet. Looks like we’re in for some interesting times. Having lived the Bardarbunga eruption presencially, for more than 4 months, I was amazed at its intensity and power. I can never forget seeing a lava field running for more than 30km northeast, when flying by a charted small aircraft. A moment of a lifetime! I agree with most of your rationale. I remember the action in 2013, and early 2014. I remember the deep quakes in these several volcanic spots, several months before August 2014. I also suspect that one of these would have been the site of a future eruption, however I, like many of us, was shocked to see the migration of the magma happening real-time, some 80km northeast, in the last two weeks of Aug 2014! I think this might happen again. It usually does in hotspot peaks. Back in the previous hotspot maxima, the action started with a minor rifting eruption southwest of Bardarbunga in 1862, it was then followed by Askja in 1875. And a few more events happen afterwards. I was amazed by your hypothesis that Vonaskard could actually be the spot where magma exits the caldera of Bardarbunga towards Veidivotn. I will NOT disagree with you! The “consensus” is that it actually travels somewhere along Hamarinn. But we already seen that Hamarinn could be instead linked mostly to Grimsvotn. I am open to all scenarios there. I just can´t agree (yet) with your rationate that it was Kistufell that triggered Bardarbunga, and that a dike formed from Kistufell towards Bardarbunga. Do you have more evidence of it? I am wilingly to accept such scenario, but I can´t remember such set of events back before Aug 2014. We did see two dikes, one towards Kistufell, and one towards Unnamed volcano, and the second one was the one that succeeded. Wasn’t there a phreatic eruption at kist, not long before bardy properly woke up. Indicating that MAYBE the plume rose up under kist, hitting a block but heating kist up like a kettle. Then finding a route over to bardy, filling bardy to bursting which then broke out at Hol? Not at Kistufell, that one hasn’t erupted in any way for a very long time. The phreatic event was at Kverkfjöll. Yes, Kistufell is situated right above the center of the plumehead. And yes there was a block in the form of a solidified lava plug corking up Kistufell forcing the magma the other way to Bardy. A correction, I did not say in any way that Veidivötn originates from Vonarskard. What I said was that it could originate from a dyke running from Bárdarbunga partly towards Vonarskard (Before turning towards Veidivötn). Sorry if I was unclear here. The evidence is very clear. The development of the dyke was very clear in the Days prior to the breach towards Holuhraun. About the next eruption, I think one VERY LIKELY spot, in my humble opinion, is southwest of Grimsvotn. In Haabunga or Thordarhyma. We have seen some quakes there, when before they were not. And at least Thordarhyma might erupt somewhat regularly during hotspot peaks. We miss its record. I kind of think that an eruption at Laki is much less likely, just by looking at historical records. Askja is another likely candidate, having had deep quakes for a long time. But I only jump when a massive swarm starts there. It may come suddently out of nowhere. And I dont exclude the scenario of a dike at Askja migrating towards Herdubreid and erupting somewhere in that region (even if not at Herdubreid proper). If magma exits usually through Vonaskard towards Veidivotn, then we have a reason to be worried. Because Vonaskard is the system that actually exhibited the greatest shift in behavior before, during and after 2014. I wouldn´t be surprised. However I only think that this will happen when Bardarbunga reservoir has filled, perhaps in 10-30 years. Not anytime in soon I think. The fact that events recently are again occuring at several spots across Vatnajokull, resembling early 2014, is a reminder that the next eruption might be seen sometime in 2017 or 2018. And it might be again big. Then of course there is Katla. There, we also have seen quakes outside of the caldera in recent times… Katla seems to behave rather similarly to Bardarbunga, being usually very noisy, and potencially extremely noisy before an eruption. Oh, my fascination with bungholes comes from my penchant for wine casks. Hey! Thank you for the article, now I am looking forward to everything that may happen in the next months. May I ask two questions that have been buzzing through my mind for some time now..
First, concerning the cycle peaks: Where are we right now? Are we close to the peak or well before the peak of the hotspot cycle? Where are we exactly? Do we know the cycle exists because of recorded eruptions? Finally, why are almost all the quakes at Haabunga/Katla/Godabunga at a very shallow depth? Since this 4,5 quake in August there have been quite a lot of stars at Myrdalsjokull. All of them show similar depths of about 0,1 km. Why? Are they purely tectonic or is the instrumentation not sufficient to locate the exact depth? First, we know the cycle peaks due to recorded eruptions. The peak activity last for 3 to 4 decades and we are probably approaching the top of the peak so to speak. There is no exact explanation of why the Katla/Godabunga earthquakes are so shallow. It is though believed that it involves the very powerful and large hydrothermal fields that are situated in the caldera. So, probably a mixture of slightly more shallow magma causing water to explode that in turn causes the shallow earthquakes. The earthquakes are not entirely tectonic and some contain fluid signatures (most likely water). The Equipment is by far good enough to give accurate depth. That would be inside the Grimsvötn Fissure Swarm. There’s still occasional quakes in the direction of Tungnafellsjokull so is an eruption there or nearby a reasonable possibility in the current/upcoming situation? And how likely is an explosive eruption at Bardarbunga compared to another effusive rift type event? Yes, it is a possibility. But it is Vonarskard that is having the earthquakes, not Tungnafellsjökull. Fascinating and very informative article, Carl – and thanks especially for assistance in showing extreme amateurs like me how to read the drumplots more intelligently. Like mjf, as I read the article I was wondering about the relationship between Bb and Vonaskard/Tungnafellsjokull (where in the last decade there have been some tectonic activity and deep earthquakes). Although the latter is a separate system from Bb, presumably it’s experiencing similar mantle plume effects to the other systems you mentioned in the article, and a conduit could form between it and Bb, too. Any thoughts? It’s one thing to see a half Chihuahua freak out when rolling backwards off a 3″ high doggie bed, quite another to see a 92 lb half Lab / half Pit do the same thing. I think the big dog was much funnier since the drop to him was much less than for the small dog, but the reaction was the same. Guessing this is volcano volume, fissure, height thing. My name is Carl and I am a Volcanoholic. It started innocently with Novarupta and ended with snorting ash in Guatemala and Iceland. It’s Texas…. what do you expect? Pretty genius way of defogging the window to use kitty litter in a sock. Personally I would use rock salt Crystals. I bet that would go clear of the meth-test Equipment. Just gonna drop a graphic I saved back in late December (24th to be exact). Nice one, Carl! It seems we are still quite some time away from renewed activity. One factor that may play a role: With the collapse of the caldera, the magma chamber is not quite at pressure equilibrium. The parts underneath the caldera wall will be slightly overpressured (at least for shallow magma chambers) and tend to flow towards the caldera. Rather than continuing collapse, I would expect a slight rebound from this. The deep quakes are different though. If you have an annotated map of the area with the names of all features, that would be a good addition to the post. I like it, but where is Tungnafellsjökull? Big (ish) earthquake in north Canada, in the northwest passage. There hadn’t been anything comparable here for 30 years. I have asked the PNSN for information about the recalcitrant faultline since I was not aware of one there. The article is updated with a map showing all pertinent details. click on them to download hi res. I like the new map! And for a clarification: when you predict ‘soon’ there will be firework, there is no time scale or schedule attached. We are not in the run-up to an eruption, and other Icelandic volcanoes are likely to erupt before Bardarbunga. What did you have in mind with ‘soon’? Years? Decades? Volcanoes have a tendency to hang around doing nothing for long times, in between bursts of activity. The duration of the lazy siesta’s seems hard to predict. Sounds like a lot of employees I’ve known. When i think soon, It means that one morning in the near future i am going to wake up to the news that it has begun. Offcource that still doesn’t mean it needs to blow up this decade. Just that it can if things line up properly. Not sure what Carl believes though. Also, “Works as hard as a volcano” is definitely going on my CV now. The circled question mark on the new map is at an interesting place. It’s at an inferred 90 degree bend in the dike – if that is in fact what we’re truly seeing. And that place corresponds to an obvious ‘seismic gap’ in the two images I posted above. A quiet zone where there are few or no earthquakes. Why would there be a quiet zone in an eruption such as this? One obvious answer would be simply that it’s a zone where the rock is too hot and ductile for brittle fracture. And the obvious place where that would be the case on a volcano is a magma reservoir. Did the dike start from the caldera and trend southeast – intersect a magma reservoir – pressurize it – and then a new dike break out trending northeast? That seems not implausible to me. Mike, I think that´s exactly what happened. That´s what Carl names “Un-named volcano” I do think there is a magma reservoir there. Interestingly magma from BB towards Grimsvotn, seems to go through the unnamed volcano, then dissects Gjálp and then towards Grimsvotn, and at Gjálp is also where a dike might follow towards Hamarinn! * what if * if unnamed volcano is actually the center of the hotspot plume, and this explains a region without earthquakes. And that basically magma within here diked both towards Holuhraun and BB caldera, instead of the conventional theory that it travelled from BB to Unnamed volcano. What if? Finally, there is another region with a possible magma reservoir almost at the point where the Holuhraun dike exits the ice cap. It even makes a small turn in direction there. And I have seen, since the eruption finished, that ocasionally deep quakes are also located there, unlike other regions along the dike. Carl, What I still don´t understand is when you stated that a dike formed from Kistufell to Bardarbunga. When did this happen? I remember seeing earthquakes forming from Bardarbunga towards Kistufell and not the other way around, in the days following 15 Aug 2014. But one think I remember. Yes, some two months before August 2014, deep quakes happened at Kistufell and Un-named volcano. I remember this very well. If the dyke (conduit) is closed or “dry”, the quakes will occur where the dyke opens again. So the direction of propagation for the quakes gives the direction of magma flow, and the advance of quakes follows the fresh magma inflow. But, if the dyke (conduit) is open until an obstacle or “end plug” — but is too narrow for the fresh magma flow due to the increased pressure — the quakes will occur where the dyke starts to widen first. We have two cases here: If the magma pressure can not propagate properly within the dyke (e.g. a thin dyke with thick magma), the situation is like above: The dyke will start widening from the magma source end, and the quakes (and pressure) will follow the magma. However, if the magma can flow and the pressure can advance the dyke properly, the pressure gradient will be highest at the end of the dyke, where it is closed (if the pressure is not enough to break it elsewhere). So, when an existing open dyke starts to experience increased pressure, the quakes can start at the end of it, and propagate also to the direction opposite to the magma flow! It all boils down to magma viscosity vs. pressure vs. boundary conditions (e.g physical dimensions, strength and hardness of rocks, etc.). The conduits for Grimsvötn are wide and open, thus we see the first quakes just before an eruption at quite shallow depths (“breaking the plug”, the last case above). The events before Holuhraun most likely enlarged an old dried dyke (the second case above). For the rest of dykes around Mr. B, the answer on the question about who feeds who (B to K, or K to B): The interpretation for direction of magma flow vs. the propagation direction of quakes depends on whether there are open or wide enough dykes already between them, or not. So I’d say these ideas are still hypotheses until the reality proves otherwise. (>——- followed by >>——) or( ——-> followed by ——>>) for which end of the (8 character long) dike starts quaking when it widens. interesting if that’s correct (my physics is a bit basic but it sounds plausible). I have the distinct feeling of being coaxed towards a part two of this article. Answering the question about the seemingly innocent word “soon” would pretty much be the same as predicting when Bárdarbunga will erupt next complete with an explanation of “why”, and that would make a certain department a bit depressed again. Looking at past eruptive episodes in Bardarbunga I feel inclined to think that Bardarbunga will not erupt again for several decades. At least not another large eruption. I will explain why. In the previous hotspot maximum, there was one rifting eruption of Bardarbunga in 1862-1864, then a smaller explosive eruption in the caldera (possibly) in 1902. Then there was a relatively good sized explosive event seemingly at same time at Hamarinn and Thordarhyma, between June-October 1910. But that might have been triggered from Grimsvotn. During the hotspot maxima, Grimsvotn erupted as frequently as every 2 years, about 8 eruptions within 25 years (and before 1910). There is also a change that some of these eruptions were incorrectly attributed to Grimsvotn and instead they happened somewhere else in Vatnajokull. Early in this hotspot maximum, just 10 years after the rifting event at Bardarbunga, there was the massive rifting and caldera eruption at Askja. But there is also a report that in 1874, as Askja was starting to erupt, there was also a second plume visible at the north edge of Vatnajokull, near Holuhraun. Also eruptions occured at Reykjanes (one in the sea), Westman Islands (one in the sea), and two fissure events east or south of Hekla. Another former hotspot maximum developed in 1700-1730, evidence is not as clear, seems to point to several smaller explosive eruptions at Bardarbunga (location is unknown), each VEI1-2 and as many as nine within 30 years, and a couple of larger explosive events at Krafla and Oraefajokull, one at Katla, one southeast of Hekla, and a smaller eruption at Kverfjoll. In sum, both previous hotspot maxima, show many smaller explosive eruptions across several locations in Vatnajokull, and a couple of large rifting or explosive events. This makes me think that we should expect such a similar pattern for this hotspot maxima, in terms of a timeline, somewhere distributed between the year 2000 to 2040. As many as 10 eruptions distributed across some 30 years, and two larger events (if Holuhraun was one, then we should expect another one, in a different location). I tend to agree with your assessment, but predicting volcanoes over the medium term is a dangerous business. Short term is fine: volcano observatories are pretty good at signs of imminent eruptions. Long term is fine: we can be sure that Bardy will erupt within the next 200 year. In between, that is harder. The recent paper suggesting an eruption in Campi Flegrei in the next ten year is an interesting attempt at a medium-term eruption. Even there, the ‘when’ is very uncertain. I tend to compare it to metal fatigue: you know a piece of metal will suddenly break at some point, but it is difficult to predict when and where. Which is why companies that cut back on maintenance tend to have unexpected failures which ‘could not have been foreseen’ as the commercial blurb likes to say. What we know is that eruptions follow the line of least resistance. For shallow explosions, that tends to be up, for deeper event, in the case of Bardy the weakest links are clearly the multiple dykes going in all directions. But which direction is next? That depends on very small things (such as the shape of the magma ‘chamber’ and minor earthquake failures) and seems more or less unpredictable. I just mentioned as the spots where deep intrusions have been taken place, to a larger degree than in other Icelandic regions. It´s a pretty safe bet that these places will probably erupt in the next hundred years (long-term). Medium-term it´s difficult to say when. I only have statistics to infer my bets. Which of course are risky business. From all the abovementioned volcanoes, it´s reasonable safe to predict that at least Grimsvotn will likely erupt within the next few years. Having had a massive renewal of fresh magma in 2011, it´s possible that something different might eventually happen in Grimsvotn fissure swarm, but that´s highly uncertain to talk about. I have ordered a fresh set of possum gizzards for the part II article to this one. You can keep em. Chicken gizzards, okay. In fact, there is a little store on the East side of Century FL on State Rd 4 that you can call ahead and have them ready for pick-up as you stop by. Fresh out of the fryer. To tell you the truth, I don’t even think possums have gizzards. They are good at carrying rabies. Keeping your dog vaccinated is a really good defense just in case they tangle with one. Given a race between a possom and a racoon fleeing a dog, the Possum will loose pretty much every time. In 1846-47, the Donner Party were stranded while trying to cross the Sierra Nevada. There is now a Interstate Highway through that portion of the mountains. California is being hammered by an atmospheric condition known as a “Pineapple Express” where warm moist air from the Pacific is shunted right into the state, striking the mountains and lifting, squeezing out copious amount of moisture. I’m guessing this is sort of wht happened in 1846-7. Close to here, are the Truckee weight scales. Yes, I see in the news that the big tree with a hole through it toppled in the wind. Sad. “Wind prone areas, especially those along US-395 will see gusts up to 80 mph at times. For the Sierra ridges, we could see winds exceeding 150 mph at times Tuesday. Yesterday I read that gusts up to 173 mph had already been observed at some peaks near Squaw Valley. Albert, what is relatively safe to say is that we will see a high frequency of eruptions across Vatnajokull, due to the fresh mantle magma that arrived, as seen in 2011 and 2014. We are quite sure about this new mantle magma influx. The new magma might have intruded several volcanoes. We don´t know which, unless we see swarms of deeper earthquakes in them. Where have we seen that? That might apply to the volcanoes where we have seen a shift in recent years, compared to quietness before. Then, we know that the change in the activity was probably caused by this flux of deep mantle magma. But where did we see this? This applies particularly to Oraefajokull, southwest of Grimsvotn (Haábunga) and, of course, to Bardarbunga system (but this one has already erupted). The only other volcano where we have seen a change is Tungnafellsjokull, but this was directly affected by Bardarbunga eruption. So we have 3 unerupted volcanoes that showed a shift in behavior. In other volcanoes this is not as clear, because they were already experiencing deeper quakes before: such as in the case of Askja, Hamarinn and Reykjanes. Katla has seen a shift too, but the volcano in nonetheless usually very noisy, and most quakes there are still shallow. Until we see a very noisy swarm of deep quakes, Katla will probably not erupt. I have also seen interesting spots across Iceland, namely 3 of them, which might have seen repeated intrusion of new magma. One located southeast of Langjokull (north of Geysir), the other in Vatnsfjall, south of Hekla, and the other is a minor intrusion south of Katla, outside of the caldera. But you are right, medium term prediction is highly uncertain. I just point the suspects. “When” is a question that no one can answer. Thank you Ian F, that map really showed how “out there” Unknownabunga is. Up untill 2008 there was just 2 earthquakes there and then a prolonged intrusion starts and it has not ended yet. It is in my opinion the mest exciting spot in Iceland. It is interesting to see the size of the quake span compared to Grimsvotn or Bardarbunga. 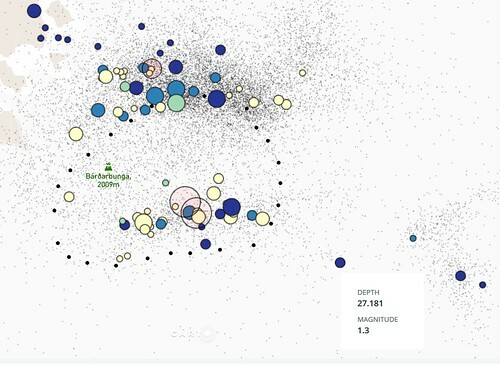 It is not so huge per se, but when you grasp that it is just made of deep and/or intrusive quakes, its actually a quite decent intrusion area. Also that it is not moving is interesting. We don´t know what lies beneath the ice cap over there. If there is nothing special, then yes, its a new central volcano being born. Otherwise there is also the possibility of a very quiet volcano (like Hofsjokull or Snaefellsjokull) hat suddently comes back to life. You wouldn´t know that Snaefellsjokull existed if it would have absolutely covered by a ice cap, without any signs of what lies beneath. With radar you would just see a mountain like many others, without any sign of earthquakes…. Unnamed volcano is located in a valley between Bardarbunga-Kistufell high terrain and Grimsvotn-Kverfjoll high terrain. Both are alinged SW-NE. In the paper I also read the following. Circa 6000 BC, all ice in Iceland was nearly gone (its the first time I read this), then the ice caps formed again circa 3000 BC. By 1900 their extent was at highest since the ice age, but their current retreat is extremely fast, at such a rate Iceland will be ice-free again by 2150. This shows how fast ice caps change in Iceland, and volcanic activity might respond accordingly. In your absolutely marvelous fantastic map (! ), one can actually see something completely novel…. And that is the forming new rift, that divides east of Reykjanes (in the sea) to connect with the propagating rift from the Westman Islands. This is a long postulated future rift of Iceland. Congratulations Ian, you did it. – Katla: Godabunga is really a shallow thing. No deep quakes there. – No significant degree of deep activity in any of the volcanoes from Langjokull to Reykjanes, includign Krisuvik. A few deep quakes recorded at Bláfjoll, and several tiny deep quakes at Hengill and Prestahnukur. – However, the volcano Eldeyarbodi, quite far out in the sea, southwest ot Reykjanes tip (do not confuse with Eldey or Geirfuglasker) has seen plenty of deep intrusions! – An impressive number of deep quakes in Bardarbunga and Un-named volcano (now we know why!). Some at Kistufell too. – Also an impressive number of deep quakes in 3 areas outside of the caldera of Askja. One northeast, and another two places further east, quite strangely! And they seem to get shallower as further east that the rift extends. Perhaps we should expect an eruption in this area! 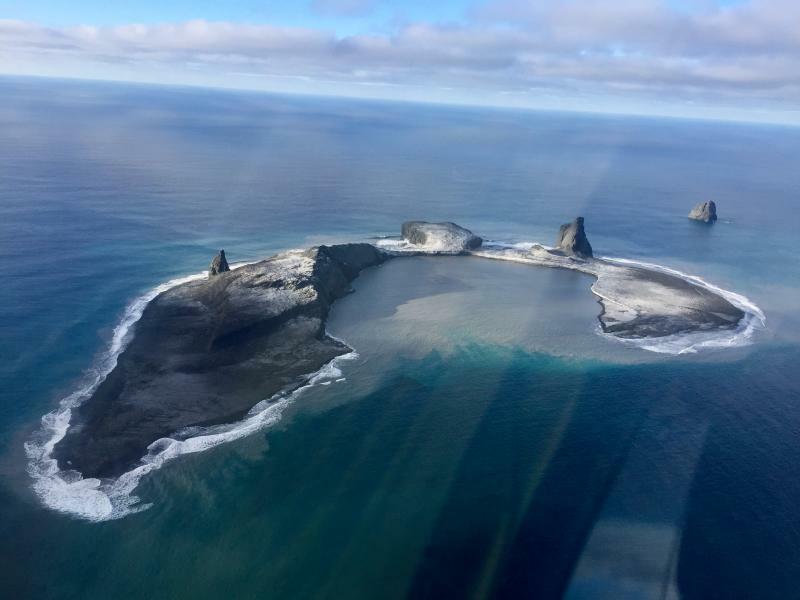 – Deep earthquakes at Esjufjoll volcano…. (and probably only the largest are detected because there are no SILS nearby). Also some at Kverfjoll. – Nothing little deep activity going on at Oraefajokull or Tungnafellsjokull. – Plenty, really plenty, of deep swarms in Tjornes fracture region. Makes me think whether actually this region is not behaving as a bit of subduction. Quakes there down to 30km deep. The map is great and fun to watch as it plays out, but for some (me), it’s really punched in how amazing it is when someone who understands the data better makes a commentary like this, describing what we see and putting some context to the blips. Hi irpsit. I’m not much but I am a beginner to this site. However there was a quake about 6 months ago which was around the 2+ mark and around 30 + km deep in the Katla caldera. This must have had an impact to the area surrounding. The caldera in question ?. No, you can expect a peak brightness of about a few months (in which it will be at least as bright as Venus during), followed by a slow fade over about 5 years back to normal stellar brightness. The initial flash may be as bright as the moon. It won’t get that bright, I think. If it is similar to the previous such event, which brightended by a factor of 500, this star will be visible by naked-eye but only just. So still a faint star. It’ll be that much brighter because it’s much closer. It’s less than 1800 ly away. Most occur at ten times that distance or more. The actual point of light is already almost-visible, it just wasn’t identified as a binary system until recently due to the closeness of the stars. At the moment the star is about 12th magnitude. Anything larger than 6 is not visible to the naked eye. It is about a factor of 200 fainter than this. When the stars merge, it will get much brighter for a while (but not explode – that is not correct in the report). The previous two cases which we know about became brighter by about 7 and 9 magnitudes. So that would predict that the current star will reach a magnitude between +3 and +5 – that is visible to the naked eye but not overly bright. It is a bit fainter than the famous double star in the middle of the tail of Ursa Major. Well this is an estimation. Never underestimate the unpredictable in astronomy! I still remember comet Holmes, that suddently increased from M 17 to M2.8 in a couple of days. This red nova could increase in 10-11 magnitudes instead of the 7-9 magnitudes (that´s very well within the realm of possibility), and that would mean a magnitude +1, as forecasted in the study. I sincerely wish for a bright event. Since the 17th century, that we wait for a spectacular supernova event. While this is not a supernova, its better than a nova. To be honest, making such prediction (time-wise) is highly risky business. Anyways, such a nova explosion at 1800 light years would most likely be very bright. There is all likelihood that it would rival Venus in the sky or even more. Compare this nova with other previous nova and supernova. At 6000 light years, a 1975 nova explosion was M1.7, as bright as the top30 of the brighest stars in the sky. Being a bit closer, at 1800 light years, this star should reach probably M1 or M0.5, which is exactly what the scientists predict. So in this regard the scientists are making a good judgment. Note: novas is when binary stars merge to some degree. Supernovas is the terminal explosion of massive stars; these are much brighter. I think that Albert errs in the side of caution, and Rich errs in the side of excitement. Most likely the nova star will reach anything between M2 to M0, so as bright as some of the brighest stars in the sky, but nothing more extraordinary. And i am skeptical about the time prediction. I think my estimates are reasonable. You list novae, which are not merger but hydrogen explosions on the surfaces of white dwarf stars. Supernovae can come from stellar mergers, but of stars that are fundamentally different from the two stars in this object. There will not be an explosion, but there will be brightening: by about a factor of two a year before the merger, and a fast spike during the merger itself. Great photo of Bogoslof from the air, note the reconstruction so to speak. Taken from the AVO website. Wow. The heart has been ripped out of the poor thing. Hopefully a new plug will fill in the hole. Nothing left of the cabin that was supposed to be located at the eruption site. 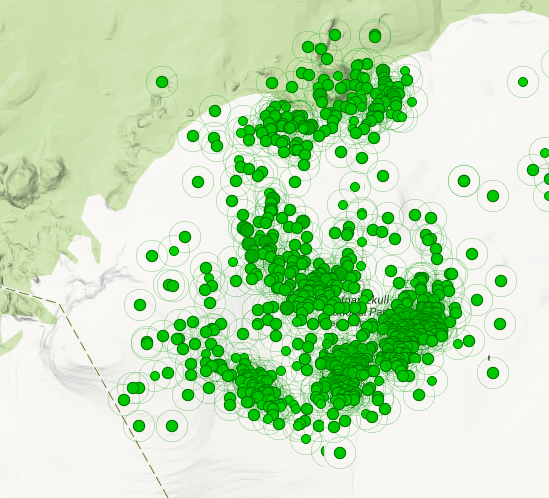 I’m a bit fascinated by the very evenly spaced string of quakes at the Reykjanes peninsula. This clearly shows how the bookshelf tectonics of SISZ extends in the direction towards the Reykjanes ridge. It’s like an entire row of books rotated ever so slightly, causing the covers of the books to rub a bit against each other. Bardarbunga floods northwards, across jökulsá á fjöllum, have the potencial of being the largest jokulhlaups (glacial floods) on Earth. Even larger than the Katla ones! 500.000 m3/s for that catastrophic flood, some 2500 years ago. For comparison, Katla floods go up to 400.000m3/s, Langjokull had a flood 200.000m3/s, Gjálp in 1996 was 50.000m3/s, and Eyja in 2010 was 3000m3/s. The amazon discharge at the ocean is 200.000m3/s. So that prehistoric catastrophic flood was more than twice the flow of the Amazon river! If you visit Iceland, you can see its marks along some spectacular canyons and waterfalls in the north part of the country. 500.000m3/s Bardarbunga flood (2.5 times larger than Amazon river). But let me state that higher estimates have placed the rate at 1.000.000m3/s!!! Lake Agassiz flood, end of ice age, also 1.000.000m3/s!!! Missoula Floods 2.600.000 to 18.000.000 m3/s (5 to 20 times larger than Bardar flood)!!! Also the Altai floods, have a similar rate. Both were ice-dam collapses. Zanclean Floods (Mediterranean Sea opening) 100.000.000m3/s (50 times larger than the former!!) That must have been a spectacular catastrophic flood! Scary reading. I wonder how populated the potentially affected area is today? You shouldn´t be scared! You are not living in Iceland! The area is scarsely populated, just some farms and tourists in the summertime, and it was a concern back in 2014, but thankfully nothing happened. Icelanders are very well prepared and also they are not afraid of such “disasters”. They are even excited to live in such a lively country. It´s part of daily life. I lived there in 2010-2015, and I was not scared, by contrary. Naturally, the fear of a large glacial flood from Bardabunga towards the southwest, where I lived in the path of it (along Thjorsá river), was a concern, but still it was fun to live in such lively volcanic land. In late 2014, I could feel M5 earthquakes every other day for four months! It was fun! I learnt a lot while living in Iceland. In other countries, like in Europe, people freak out about everything, about every climate disturbance, about every snow obstacle, or gloomy winter weather, they are freak about such disruptions like Eyjafjallajokull. Or in parts of Italy, where the fear of earthquakes is tabu and burried deep in the mind. I got tired of this grumpiness, of this attitude. In Iceland, no one worries that much, no one hides the risks of living near volcanoes or their impact, everyone seems to live in a very healthy relationship with the massive power of nature. And welcome its power. I have several Icelandic close friends with families living there although not in the east. Also visiting Iceland frequently. Closely connected. But yes, I realize the very tight monitoring makes it unlikely that something bad would happen without warning, and planning is in place for the worst. That sort of attitude results in happiness, wherever you are and whatever you do. That’s why so many europeans are miserable all the time, particularly those that angst about ecothings instead of dealing with them! With a new post up. nobody will ever read this…. ah well, no need to angst about it …..
That’s a downside of having this blog format. Many discussions are killed whenever there is a new post. I usually go back a couple of times to check for new comments. Yes, apologies for the new post which made this discussion extinct. I had been told I would get style points for doing mass extinctions on Friday 13th..
Is Bob re awakening on El Hierro. Also noted yeasterday, seem to fade out today. Nothing unusual on the Islands closeby.. It is beginning to look like water is the lubricant that oils the machine that recycles Earth’s crust. Might that have a bearing on the difference between Earth (plate tectonics) and Venus (no plate tectonics -apparently- despite near identical size/composition)? Psst… there is already a solution. from IMO: An earthquake of M3,0 occurred 7km ENE of Bardarbunga at 23:58 (12 January). They dont say a word about magmatic movement. Whatever it is, it seems to me the number of earthquakes is greater than usual. False or true? Look at this graph. 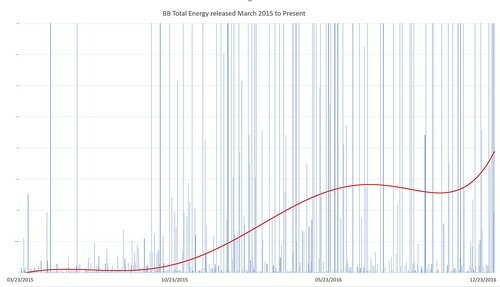 The slope of the cumulative seismic moment release seems to be constant since around December 2015. Carl previously said that the number of quakes >M3 had reduced, but I don’t see any real change at all in the publicly available data. The human side of science: name a moon after your mother in law. Saturn is very far away. Didnt they already do that with Phobos and Deimos? Could someone please explain if I am reading this graph wrong . Are these signals not earthquake related on La Palma . New post is up. It is Friday the 13th. Be afraid. Be very afraid.